RSA Director, Maxine Schackman, at the IAYC conference on Nov. 15 in Boca Raton, FL. 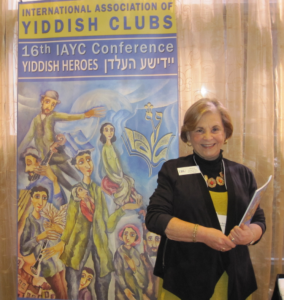 RSA director, Maxine Schackman, told the audience at the International Association of Yiddish Clubs conference in Boca Raton that FAU Libraries has been collecting Judaic recordings since 2002. “We take these antique recordings and digitize them so that a new generation can learn and enjoy what came before them,” she said. The Recorded Sound Archives website has the largest searchable online collection of Jewish music in the world with recordings by 7,344 Jewish performers, 13,776 albums and 72, 577 song titles. Among the musical pieces Schackman presented that had the audience laughing and singing along were “Roumania, Roumania,” written and performed by Yiddish theater star Aaron Lebedeff; “Good Night ‘Oy Vey’ Irene”, a Yiddish parody of “Good Night Irene” sung by Seymour Rechtzeit and written by his wife, Miraim Kressyn; and “Bei Mir Bistu Shein,” a Yiddish swing song that became a number-one single in America in 1938 as recorded by the Andrews Sisters. CLICK HERE to listen to a selection of Yiddish recordings. CLICK HERE for full story written by Randall Lieberman and published in Jewish Journal. Now you can celebrate the 4th of July and your Jewish heritage at the same time. 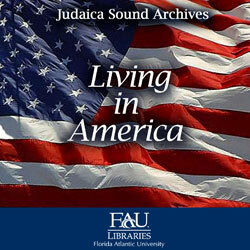 This new compilation of songs from the Judaica Sound Archives at Florida Atlantic University Libraries in Boca Raton, FL is about the American Jewish experience. It contains Yiddish songs recorded during the early 20th century and expresses a Jewish immigrant perspective on New York, Coney Island and other things distinctly American. Click on the image above to hear this special compilation of songs from the JSA. 1. My America’s Free: Written byJerome Lipman and Irving Lewis. Sung by Molly Picon and Seymour Rechtzeit with the Abraham Ellstein Orchestra and Dave Tarras on clarinet. This upbeat tune lists some of the many things to love about America…..especially freedom! 2. Ich Dank dir Got fur America: Sung by Liebele Waldman. 3. America: Sung by Yiddish Theater star, Josef Feldman. 4. Yankee Doodle: This well-known Anglo-American song from the revolutionary War era is sung by Jewish singer/educator, Judy Caplan Ginsburgh. 5. I’m Going to Miami: Benny Bell tells a story of his trip to Miami Beach, Florida by train. 6. Hot Dogs and Knishes: Aaron Lebedeff sings this comic Yiddish song about Coney Island, NY. 8. America Ich Lieb Dich (America I Love You): Sung by Yiddish Theater star, Gus Goldstein. 10. Carry Me Back to Old Virginny: Originally a song sung by Confederate soldiers during the Civil War, it was recast in 1878 from the slave’s perspective. This 1916 recording by Jewish opera star, Alma Gluck, is said to have been the first operatic celebrity recording to ever sell a million copies. 11. Tell That to the Marines: Written during WWI, sung by Al Jolson. 12. God Bless the USA: This recordingis from the Judy Caplan Ginsburgh album, Musical America. 13. America America: Mike Burstyn’s tribute to the land of his birth sung in Hebrew. 14. America the Beautiful: This recording by a very young Frank Sinatra is from FAU’s Recorded Sound Archives Vintage 78rpm music collection.